Anonymous, the Internet hacktivist hacked into 'Anglo American' and dump their complete database online. The dump includes the Personal details of 122 investors, and more than 400 registered share holders details and other database also. Anglo American is a British multinational mining company headquartered in London, United Kingdom. They are the world's largest primary producer of platinum and mine many other things like diamonds, copper, nickel, iron ore and metallurgical and thermal coal. The attack against Anglo American is part of a larger Anonymous operation - Operation Green Rights. In a statement hackers said,"Anglo American, you destroy nature and pursue and kill indigenous people. We say enough to all of this,"
"In the name of tribal leaders, whom you have offended, and the natives you have deported, in the name of the miners killed during a strike against your dirty company, in the name of nature that you consider as a source of gain: We curse you! We are Anonymous" hacker added. 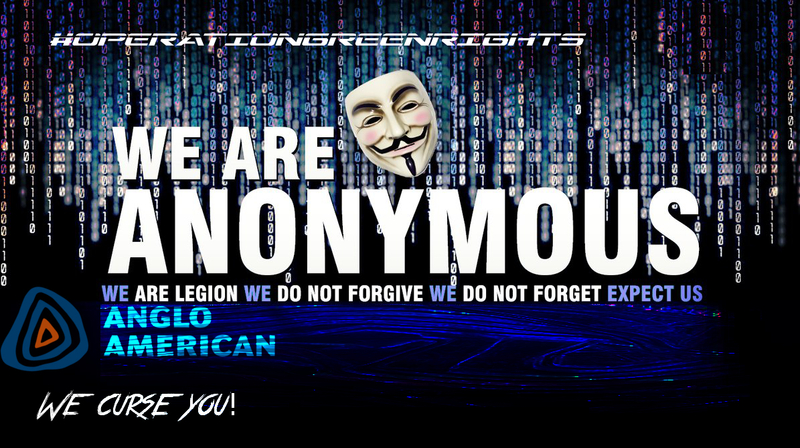 In previous attacks, Anonymous targets the Tar Sands, Monsanto, oil firms, AVX Corporation under Operation Green Rights.